I’m so pleased to introduce new author and my dear friend, Carra Copelin. Carra Copelin writes contemporary and historical romances but, unlike so many other authors, she didn’t write from childhood or read long into the night beneath the covers with a flashlight. She found romance novels and authors like Linda Lael Miller, Barbara Bretton and Suzanne Brockman as an adult. After reading about a million, she discovered numerous people residing in her head, all looking for a way onto the printed page. A member of Romance Writers of America and Yellow Rose Romance Writers, Carra is a regular contributor to a new team blog, Smart Girls Read Romance, as well as to the acclaimed Sweethearts of the West blog. 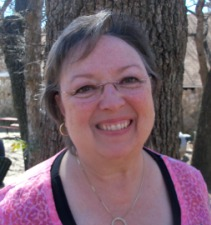 Carra and her husband live in North Central Texas, in the Dallas-Fort Worth Metroplex, where she enjoys her family and playing with her grandchildren. In addition to writing and researching with her fabulous critique partners, she enjoys her Bridge group, crocheting and tracking down relatives through genealogy investigation. Find Carra on her website, blogs, Facebook, Twitter, Goodreads and Wattpad. Hint: she loves to hear from readers at http://carracopelin.com . Hi Carra. I so glad you found time to visit me. Lyn, thank you for having me today. I love being here with you and your readers. I’m excited to share some things about me and my writing. Terrific! First, please tell us how you began writing. Well, as mentioned above, I had all these people running around in my head, each one screaming to be heard. There were days I questioned my decision to attempt writing a book, but then, once I started this journey, there was no going back. Yup, it’s a path of no return. I know you use a pen name. Do you mind explaining how you chose it? Not at all. I do write under a pen name. Several family members and close friends have known through the years that I write. A couple of years ago, though, when I decided to publish a blog, place posts on Facebook, and start a Twitter account for my writing career, I couldn’t bring myself to use my real name. Somehow I imagined finger pointing if I never published. Finding another name wasn’t easy. My DH made a couple of suggestions, but I picked an obvious one for me. Carr was my maiden name, I added an A from my first name. Cope was a sure thing and my middle name is Lynn. So, Carra Copelin was born one late, late night in front of the computer screen. I think you chose very well. Carra is such a romantic name! Are you self-published? If so, what made you choose this route? Yes, I’m self-published, and this wasn’t an easy decision to make. I wanted the prestige and security that comes with traditional publishing. There is also a validation that you’re a real bonafide author when you have a publishing house behind you and your work. Nowadays, though, the security may or may not be as it once was, also the houses used to do all the promotion needed for a book, which, due to the state of things, is much less now. I decided to self-publish to have control of my book. Period. I can develop my story as I want, have the content/length as it needs to be for the story, choose my own title, cover and character names. Plus the real kicker—the royalties are better than with a traditional publisher. That they are. How about your writing process – are you a plotter or a pantser? Why? LOL! Yes, I recognize myself. I’m definitely a plotter. We all have our way of writing. So you have critique partners and/or beta readers? I sure do. If not for my critique partners, I would still be spinning my wheels and rewriting the same pitiful offerings. I know this for that’s what I did for nearly ten years. I was lucky to have found a wonderful group of writers who are caring and nurturing, while at the same time demand progress toward the finished product. The key is belonging to a group that’s right for your writing needs. If you don’t have this, you’ll just tread water. Currently, I have one beta reader. After the critiquers have picked, hammered and edited, I send the book to my little reader before it flies over to my editor. I’m amazed at what she finds that we missed. It’s the same for me. What project(s) are you working on now? I currently have three projects. First is the second book in the Texas Code Series, CODE OF CONSCIENCE, which takes place in El Paso, Texas and Juarez, Mexico. It involves cartels, undercover agents, and romance. Next are two historical romance novellas chronicling the Benning and McTiernan clans after they come from Ireland to Texas in 1875. Those titles are, KATIE AND THE IRISH TEXAN, and MATELYN AND THE TEXAS RANGER. Great titles! Can’t wait to read them. What advice would you give beginning writers? Write. Every day. Surround yourself with other writers by joining a local writing chapter and critique group. This may sound cliché, but it is KEY. Originally, I joined RWA and my local chapter, found a good supportive critique group for several years. We broke up when two of our members moved away, then life happened and, due to my job’s demands, I stopped writing. I didn’t write consistently for eleven years. One day, fairly suddenly, I found myself retired. Good things began to happen. I joined my local chapter, Yellow Rose RWA, found a new supportive and nurturing critique group and the rest, as they say, is history. One last question: Would you tell us about your debut book? Absolutely! CODE OF HONOR is book one in my Texas Code Series. Graeme McAlister has returned home to Texas to discover why his foster brother overdosed on morphine and crashed the company jet. The idea makes no sense, but the NTSB and coroner’s reports both confirm suicide. Graeme’s determined to unearth the truth and return to Washington, D.C. but, when he sees his brother’s widow, will he be able to handle the biggest revelation of all? A widow at the age of twenty-eight, Maggie Benning, resolves to establish a successful and independent life for herself and her five-year-old son, Andy. Her initial goal is getting back her RN job at the hospital ER where she was accused of stealing the drugs that killed her husband ten months ago. She’s reconstructing her shattered life when Graeme McAlister comes back to McTiernan, Texas and stirs up old memories and feelings she thought long buried. Can she overcome past hurt and loss of trust to accept the possibility of a new love in her life? Maggie took her place behind the scarred, antique oak bar. She tied a worn bleached-white apron over her jeans, gathered the empty glasses and bottles and swiped a bar towel over the sticky remnants of beer and mixed drinks spilled earlier in the afternoon. She looked across the bar, through layers of swirled smoke, to the handful of customers sitting at tables surrounding the dance floor. Businessmen and good old boys exchanged stories from their day while enjoying the frigid indoor temperature, band members set up their equipment, and a few cowboys played pool off to the far right. Two men sat at a table in a shadowed back corner, their heads angled close in deep conversation. It was too dark to see their faces, but they appeared almost angry at times, each taking his turn stabbing the tabletop with an index finger to make his point. Maggie wondered what their story was. Were they discussing a major transaction, ranchers making a deal or enemies settling a score? Before her imagination could run any other direction, Harry walked up with a stack of clean towels. He placed them on a shelf behind the bar then stood between her and her curiosity, effectively blocking her view. Jaw clenched and tense as a bull rider waiting for the gate to spring open, Graeme stared at the drink in his hand as his older brother took verbal swings at his character. “Now that you’re back, do you have the balls to stay, or are you going to turn tail and disappear again?” With that final sarcastic shot, he finally shut-up. Graeme pushed upright in his chair to loosen the kinks from his back and shoulders. Every muscle screamed a protest at being bunched in a knot. Elliott’s words stung like the slap of Andrew’s hand the first time Graeme had openly defied an order. He supposed, in all fairness, his brother had a right to ask the question. Whether one was born a Benning or raised as one, family meant everything. And, while he hadn’t had a choice on whether to go or stay, he hadn’t been available when the family had needed him. While Graeme didn’t have an answer yet, he damn sure had a few questions of his own for Dallas County’s Assistant District Attorney. Graeme took a swig from his longneck as Elliott mirrored his actions. They were, he thought, like two grade school opponents sizing each other up on the playground at recess. Graeme swiped at the condensation on the beer bottle while deciding where to begin. “No. Not a clue.” Elliott shifted in his chair, repositioned his beer. His foster brother made it apparent that he was unaccustomed to being questioned. Either that or there was something else he wasn’t saying. “Yeah, that goody two-shoes act used to piss me off. We could never wheedle anything out of him.” Graeme shook his head and grinned. Graeme swiveled around to see Maggie standing behind the bar. While he tried to decide whether to go up to her now or wait until tomorrow, Maggie looked out across the room and made eye contact. Great interview. Carra, I love CODE OF HONOR and look forward to your next release. Thanks you, Caroline! It’s great to see you here.